last week on sytyc you voted and i made it yet one more week! thanks. this next theme is new years. go check it out now. the other two girls that are left are two girls that i can call friends, and they are so talented! last week i made this little quilt and gave it as a gift to my little girl. this little quilt has made me realize is that i really miss finishing quilts. i have three that are started and not necessarily being worked on. i feel like i haven't had time. this last year has been a whirlwind, and i've been busy, but this year i want to try to focus on getting a few more quilts done. yes, that's one of my goals. that's the word of the year for me. do you have a word? i will pick a few things that i will be consistent on, and hope to improve from there. those three categories are the most important to me and can encompass almost anything. i like that. so here's to a good consistent year. Way to go Vanessa!!! I just knew that was your cute little quilt when I voted! "Consistency" is a great word for 2010. I posted my 2010 Goals blog (rather than resolutions) yesterday. I love your little mommy quilt. The colors are so fresh and vibrant; the perfect color pick-me-up during these dark winter months. Good luck on the next round! Well I didn't have a word for the year but I have decided to take yours! You pretty much summed up exactly what I've been thinking lately! And your three categories sum up my life as well! I too am going to do my best (my ADD allowing!) to be more consistent this year in all the spiritual, physical, creative and I'd like to add on educational, aspects of my life! Thanks for the inspiring post! And what a lovely little baby doll blanket! Your daughter will treasure it for years! 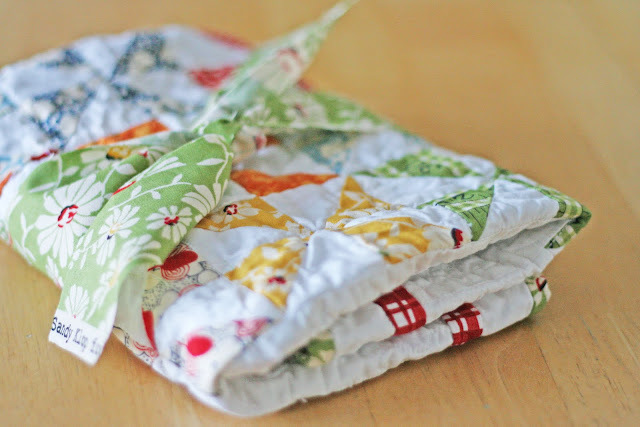 Awww...I L-O-V-E this tiny little quilt and wanted you to win SO BAD so there would be a tutorial for sure. So glad you are in the game still--I love your stuff. My word for the year is AWARE. I want to be more aware of what is going on with me and what I can do for others. Hope it helps set the pace for me this year! I love how you tied it up! What a great idea for the little extra you never know what to do with. I love that little quilt. It's so pretty and cozy. Just what every dolly needs. Best of luck with being consistent in the new year! P.S. If you ever have healthy recipes or ideas for getting in shape/ being healthy that you'd like to contribute please let me know! Hehehe, I knew this one was yours again! Of course, you know that I used your pinwheel tutorial in that most recent baby quilt I did. I'm glad you're doing so well in the polls! I love your word! Consistency is a great goal. I need to find a word that will fit my goals. I love this quilt! About a year ago, when I found out I was having twins, I made one similar to this (but baby size). I LOVE IT. To this day, it is probably my favorite quilt. In fact, I love it so much that my little kiddo doesn't even get to use it. Sorry little baby! I keep it hung on the wall in their room. You get finishing those quilts!!!! :) I want to see them. And finish mine while your at it! love those words! Love the little quilts too. All the best for this year, a great start. Also thought I'd mention that it's very easy to know which yours is with your talking about consistency both on your blog and on sytyc. Very cute..we are big Madeline fans! I voted for your little quilt! Will you be offering the pattern? For sale in your Etsy shop, perhaps?? V! That cute is so so so darling. I want one. I wish I had the patience to make my own. I love it. LOVE the quilt!! You did a beautiful job! Also....I really like the red sandals in you banner picture. I would LOVE to find a pair...I'd even paint my toenails red!! Congrats to you. 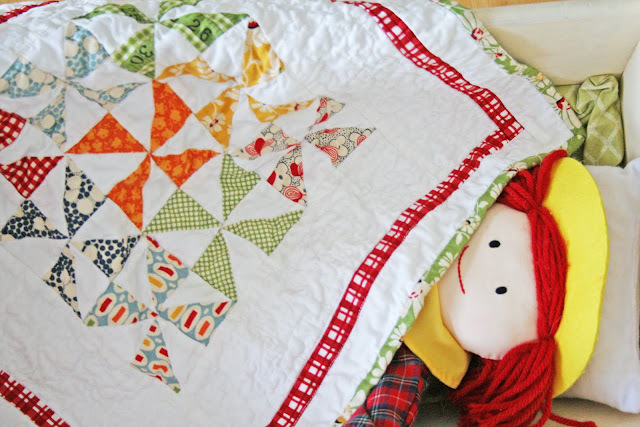 I love that little doll quilt. Keep up the good work! I love your word - consistency - that's all we can ask for right? I think I'll borrow it and see where it takes me this year. Thanks! I'm making my very first ever pinwheel quilt this month. Your darling gem of comfort and Miss Print's is spurring me on! the tutorial for this quilt will be up soon i promise.